Comparative primary texts about Purity and Social Relations (see esp "Tax Collectors Visit," from Mishnah, Midrash, Tosefta, and Babylonian Talmud. At Mahlon H. Smith's (Rutgers University) Into His Own: Perspective on the World of Jesus. "The world forsakes the grace of God, and yet is unwilling that it should be bestowed upon others." "Those who sincerely desire a sight of Christ, like Zaccheus, will break through opposition, and take pains to see him." The Conversion of Zacchaeus (Luke 19:9-10): sermon by George Whitefield. "What a strange mixture of passions must Zaccheus have now felt, hearing one speak, as knowing both his name and his heart!" "Effectual Calling," Luke 19:5, Charles H. Spurgeon, 1856. "What greater proof of a change of heart! His heart had been on riches; now at once he consecrates one-half to the relief of suffering." "The Honoured Guest," Luke 19:6, Charles H. Spurgeon, 1915. Commentary, Luke 19:1-10, Meda Stamper, at WorkingPreacher.org, Luther Seminary, 2013. "Following on last week's parable, we find another story of a tax collector and a sinner and of God's intention to seek and to save the lost." "Zaccheus," sermon discussion from Frederick Buechner, Frederick Buechner Blog. "Zaccheus, they're all of them peculiar as Hell, to put it quite literally, and yet you can't help feeling that, like Zaccheus, they're all of them somehow treasured too." "A Short Story about Saints and Bullies," Nancy Rockwell, The Bite in the Apple, 2013. "Most of us, and I include myself, prefer our saints to be heroic. We edit their stories to the nub of their heroism. We tell ourselves that athletes can be our heroes, or decorated soldiers, dancing movie stars, the beautiful and the well-dressed." "Who Can Be Saved? This Guy!" D. Mark Davis, Left Behind and Loving It, 2013.
" I'm reading that 'Zacchaeus' means 'pure.' Does that have any significance or even ironic significance for this story?" "The Power of Persistence, Part 3," Alyce M. McKenzie, Edgy Exegesis, 2013. "The broad witness of Scripture from both testaments shows that God has great timing, even if human beings don't." "A Repentant Sinner or a Hidden Saint?" Daniel B. Clendenin, The Journey with Jesus: Notes to Myself, Journey with Jesus Foundation, 2013. "The Episcopal priest Elizabeth Kaeton notes the several ironies here. The despicable Zacchaeus is the generous one." "The Most Gracious Guest," David Sellery, 2013. "Contemporary and Awful and Faithful," Stan Duncan, If You Lived Here You'd Be Home by Now, 2013. "Standing in Another's Shoes," Christopher Burkett, PreacherRhetorica, 2013. Crazy Love, Anne Howard, The Beatitudes Society, 2013. "Minister to the 1%?" Carol Howard Merritt, The Hardest Question, 2013. "What do we do whenwe realize that wee man is a wretch?" The Lectionary Lab, Pentecost +24, the Rev'ds Dr. John Fairless and Delmer Chilton (aka "Two Bubbas and a Bible"), 2013. Lectionary Lab Live podcast. "The Holy Tax Collector," Andrew Prior, 2013. "Zacchaeus: Short and Un-Seen," study guide for adults, Robert B. Kruschwitz, (other resources at) "Disability," Christian Reflection, The Center for Christian Ethics at Baylor University, 2013. Focus article: "Zacchaeus: Short and Un-Seen," by Amos Yong. "First Thoughts on Year C Gospel Passages in the Lectionary," Pentecost 24, William Loader, Murdoch University, Uniting Church in Australia. "We do an injustice to the story if we reduce it to the cheap category of a wonder conversion and fail to bring out that conversion here means transformation which includes the budget." Comentario del Evangelio, San Lucas 19:1-10, Gilberto Ruiz, WorkingPreacher.org, Luther Seminary, 2010. "Una interpretación común de este pasaje presume que Zaqueo es un pecador quien se arrepiente y experimenta una transformación total de resultas de su encuentro con Jesús." "How do we rescue people from greed?" Jesus and Zacchaeus, audio telling, story in episodes, graphic, audio and written commentaries. Go Tell Communications, Biblical Storytelling for the Global Village, 2010. "Zacchaeus and the Reformation," David Lose, Dear Working Preacher, 2010. "Maybe justice is our way of tracking each other, our way of defining each other, of keeping count, of keeping score, of following who's in and who's out, who's up and who's down. If this is so, if God's love regularly trumps God's justice ? and I believe Jesus dies precisely to show us that it is ? then we're operating with flawed categories." Dominoes, Anyone? Alyce McKenzie, Faith Forward, Patheos, 2010. "This encounter between a popular healer and the least popular member of the Jericho Rotary Club seems coincidental, almost casual on first reading. But there are a couple of not- so- casual details. Jesus seems to know just the right spot under just the right tree..."
Holy Textures, Understanding the Bible in its own time and in ours, Luke 19:1-10, David Ewart, 2010. "One possible moral of this story is to realize that salvation does not require, nor result in, perfection. Salvation in this lifetime is a process - the healing and reconciling that is needed for creating right relationships within which compromised, impure, and sinful people - like us - can live within, in response to, and toward, the realm of God." "Camouflaged by Shame," Peter Woods, I Am Listening, 2010. "Here is the good news. Jesus is drawn to shame. Shame and sadness are the phemerones that attract the amazing grace of Jesus." Dylan's Lectionary Blog, Proper 26C, 2004. Biblical Scholar Sarah Dylan Breuer looks at readings for the coming Sunday in the lectionary of the Episcopal Church. "This chief tax collector, who receives only disdain from his neighbors, is actually far more generous and intentional about doing justice than is the respectable ruler of Luke 18:18-25." "Even a Rich Man Can Be Saved," The Politics of God: The Way to the Cross, Eugene C. Kreider, Texts in Context, Word & World, Luther Northwestern Theological School, 1986. "The Zacchaeus story is the final stroke that does away with any suspicion that Jesus has been talking about morality in the previous pericopes." "The Politics of Salvation," study guide for adults, Robert B. Kruschwitz, (other resources at) "Forgiveness," Christian Reflection, The Center for Christian Ethics at Baylor University, 2001. Wellspring of the Gospel, Ordinary 31, Catherine McElhinney and Kathryn Turner, Weekly Wellsprings. "Be brave and ask yourself - what criticisms could people make about you - as good reasons why Jesus shouldn't come? How would you stand your ground - what response would you make to the criticism?" "The Town of Jericho and Zacchaeus," Andrew Marr, OSB. "The challenge of this story...is not limited to the possible conversion of one person, but it extends to the possible conversion of the whole community." "He Shocks Us Again," Ordinary 31, Fr. Gerry Pierse, C.Ss.R., from Sundays Into Silence: Reflections on the Sunday Gospels in the Light of Christian Meditation. Claretian Publications. "The true attitude of prayer is to open oneself to God?s unconditional love for us." "Jesus and Zacchaeus," Rev. Bryan Findlayson, Lectionary Bible Studies and Sermons, Pumpkin Cottage Ministry Resources. "From the Sublime to the Ridiculous," a study from the Biblical Studies Foundation. "...while salvation is not by works, when genuine salvation comes to a man, his life radically changes." "It may all be summed up in the simple formula, to bring Christ to men and men to Christ." "Global Poverty: Beyond Utopian Visions," Thomas E. Phillips, (other resources at) "Global Wealth," Christian Reflection, The Center for Christian Ethics at Baylor University, 2007. "The crisis of poverty in the world?s largest cities, which is growing exponentially worse in the new era of globalization, should overwhelm us. However, it should not paralyze us. Scripture may not offer an easy answer, but it does provide a consistent moral imperative." Baarda, Tjitze, "The 'Foolish' or 'Deaf' Fig-Tree: Concerning Luke 19:4 in the Diatessaraon," Novum Testamentum, 2001. Bondi, Roberta, "The Short One," The Christian Century, 2004. Byamungu, Gosbert T.M., "Grace as Subversive Surprise: A Reading of Psalm 130 and Luke 19:1-10," Ecumenical Review, 2004. Duke, Paul D., "A Festive Repentance," The Christian Century, 1995. Hamm, Dennis, S.J., "Luke 19:8 Once Again: Does Zacchaeus Defend or Resolve?" Journal of Biblical Literature, 1988. Hertig, Paul, "The Jubilee Mission of Jesus in the Gospel of Luke: Reversals of Fortunes," Missiology, 1998. Hobbie, F. Wellford, "Luke 19:1-10, Expository Article," Interpretation, 1977. Kreider, Eugene C., "The Politics of God: The Way to the Cross," Word & World, 1986. Loewe, William P., "An Interpretation of Luke 19:1-10," The Catholic Biblical Quarterly, 1974. O'Hanlon, John, "The Story of Zacchaeus and the Lukan Ethic," Journal for the Study of the New Testament, 1981. O'Toole, Robert F., S.J., "The Literary Form of Luke 19:1-10," Journal of Biblical Literature, 1991. Ravens, D.A.S., "Zacchaeus: The Final Part of a Lucan Triptych?" Journal for the Study of the New Testament, 1991. Tannehill, Robert C., "The Story of Zacchaeus as Rhetoric: Luke 19:1-10," Semeia, 1993. Thompson, Virgil, "Preaching the Justification of Zacchaeus," Lutheran Quarterly, 2009. Walker, William O., Jr., "Jesus and the Tax Collectors," Journal of Biblical Literature, 1978. West, Audrey, "House Calls," The Christian Century, 2007. Westhelle, Vitor, "Exposing Zacchaeus," The Christian Century, 2006. Yamasaki, Gary, "Point of View in a Gospel Story: What Difference Does It Make? Luke 19:1-10 as a Test Case," Journal of Biblical Literature, 2006. "Changed from a Taker to a Giver," the Rev. Bill Wilson, Day 1, 2004. "Grit, Grace and Gratitude," the Rev. Dr. James W. Moore, Day 1, 2001. "Zacchaeus," Pastor Edward F. Markquart, Grace Lutheran Church, Seattle, Washington. Worshiping with Children, Proper 26, Including children in the congregation's worship, using the Revised Common Lectionary, Carolyn C. Brown, 2013. 2010. "Storypath Lectionary Links: Connecting Children's Literature with our Faith Story," November 3, 2013, Union Presbyterian Seminary. Connections: Luke 19:1-10 and Wings by Christopher Myers. 2010. 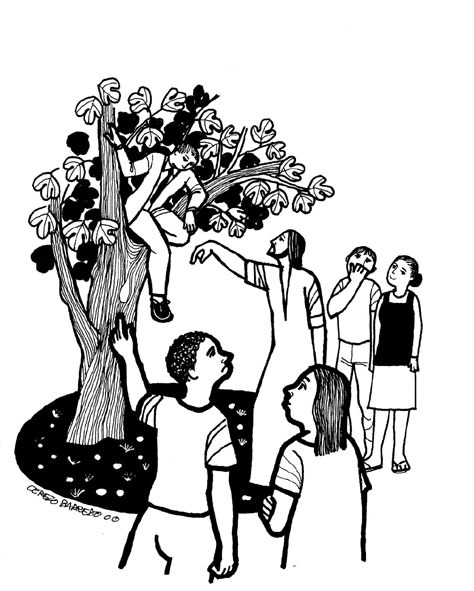 "Zacchaeus," Illustrating the Story (lessons, children's sermons), coloring pages, activity sheets, crafts, children's songs. MSSS Crafts. "Big or Small - It Doesn't Matter at All," Charles Kirkpatrick, Sermons4kids.com. "Zacchaeus Repents," Jim Kerlin, childrensermons.com. "Tree Trouble!" Steven Wilson, The Children's Chapel. "Zacchaeus," children's study, puzzles, coloring sheet, etc. Higher Praise Christian Center. "The Cheater Finds a Friend," April Hicks, sermons4kids.com. Zacchaeus Maze Puzzle, Zacchaeus Word Search, sermons4kids.com. "Calling Zacchaeus," Pete Haynes, Long Green Valley Church of the Brethren, Glen Arm, Maryland. "Tall Timber," Michele Pitman, dramatix. "Are We Lost?" Joanne Miller, dramatix. Clip Art Images: Luke 19:1-10, Luke 19:1-10 #2, Misioneros Del Sagrado Corazón en el Perú. Luke 19:1-10 at Cerezo Barredo's weekly gospel illustration. Liberation emphasis. Zaccheus Clip Art. Anglican Diocese of Dunedin, New Zealand. Zacchaeus, A Little Man Who Made It Big PowerPoint Slide Masters. Henry Martin, sermons4kids.com. Hymns with Scripture Allusions: Luke 19:10. The Cyber Hymnal.